This is a guest post written by Skubana. Skubana is an all in one solution that unifies operations for online merchants after the checkout. Skubana automates everything from order management, order fulfillment, inventory management and purchase order management. 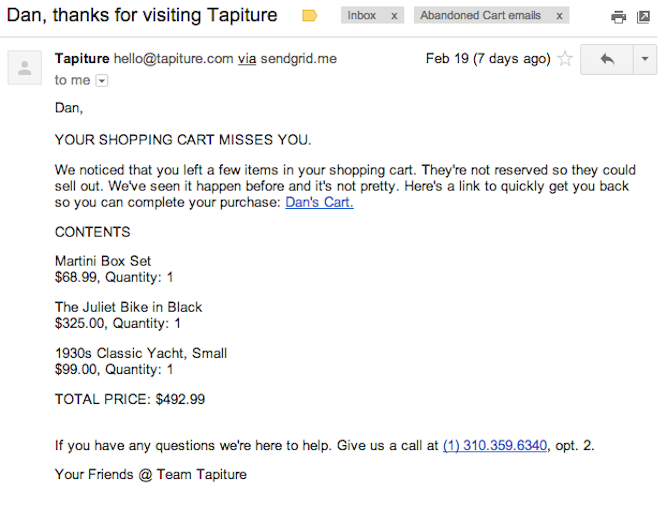 Abandoned carts are a huge issue for eCommerce stores. How big of a problem? It’s estimated that 69% of shoppers abandon their carts. That equals a staggering $260 billion in lost revenue. Imagine if you owned a brick-and-mortar store and 69% of your customers were filling their shopping carts and then leaving without actually purchasing anything. You’d make it your top priority to figure out why carts were being abandoned and how you could reduce the number. You should approach abandoned eCommerce carts with the same zeal. Here’s the good news. About 75% of shoppers who abandon their carts plan on coming back to complete the purchase, and 60% who receive abandoned cart email reminders complete their purchase within 24 hours. In other words, sending emails to those who have abandoned carts is critically important. If you don’t, you’re letting a lot of money walk out the digital door. But how many emails should you send? And what types of emails? Most experts recommend between 2-4 emails. We recommend you send out the following three. You’re going to send your first email within 24 hours of the abandoned cart, and your primary goal is to be helpful, not salesly. 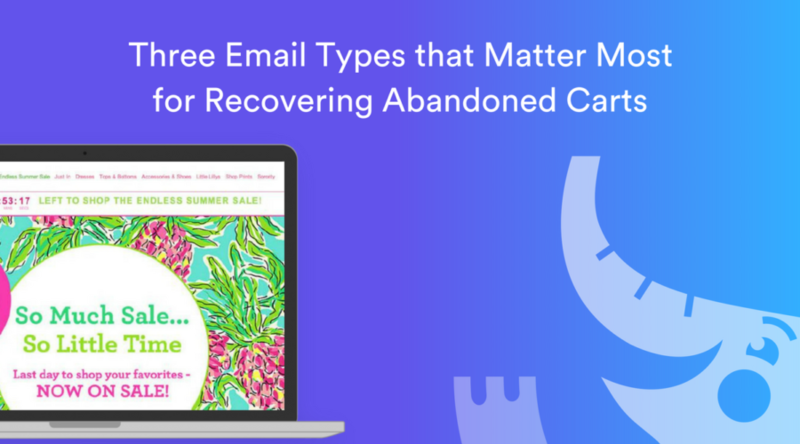 Anytime you send an abandoned cart email, there’s the potential that the customer could get irritated, so the first email should address any problems they had in completing their order. Maybe they encountered technical difficulties. Maybe your site was running too slow or maybe their payment was declined. Maybe your landing page didn’t match the message of your advertisement. Maybe they just forgot. It’s important to note that in order to customize your message effectively, you need to know where the customer abandoned their cart. In other words, you need a firm grasp on your eCommerce analytics. Was it when they encountered the shipping fees, when their payment was declined, or at the very start when they started to fill in the billing information? Once you know this information, you can customize the email so it offers helpful solutions, like payment alternatives or cheaper shipping options. What should this email include? While they don’t include a visual of what was left, they do include a detailed description. 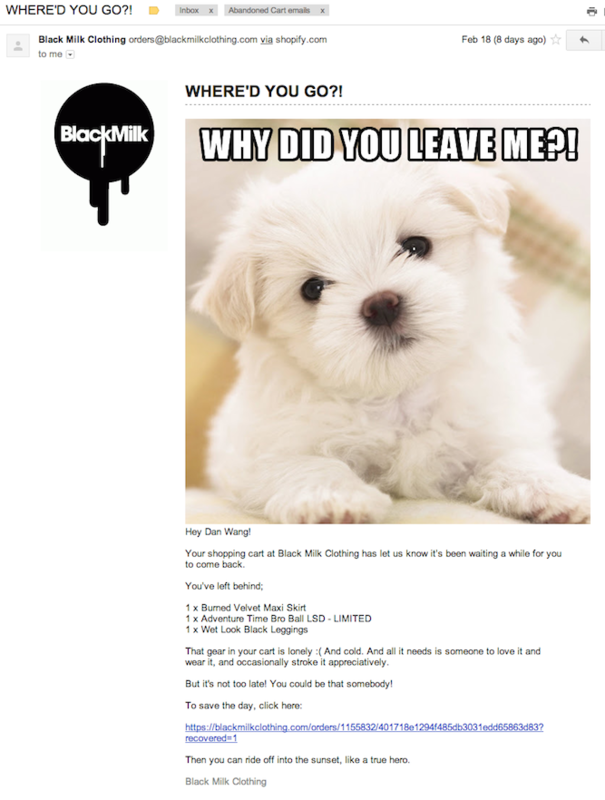 The picture of the puppy and the copy are cute and funny, rather than pushy and aggressive. And finally, a specific link back to the cart is provided. 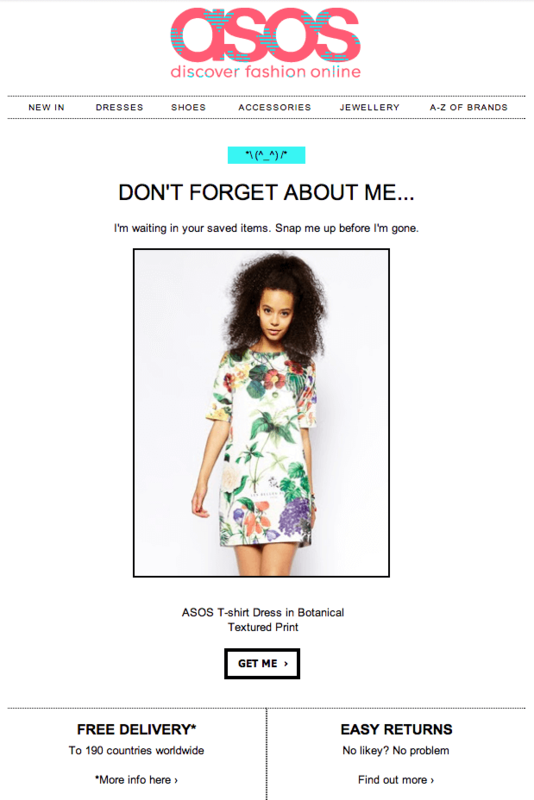 This email from ASOS also works well. It has an image of the product left in the cart, clever copy, and a clear call-to-action button. It also reminds the customer that they offer free shipping and easy returns, which are possible objections to making the purchase. Your first email is meant to serve as a friendly reminder that they left something in their cart and to prompt them to complete the purchase. Copy that’s warm and even humorous (if it matches your brand) can work well. The second email should be sent at least 24 hours after the first. You want to give the customer time to read and respond to the first email before you send a second one. The second email should be a bit stronger than the first and should create a sense of urgency. You want your customers to know that there is a reason why they should come and complete their purchase immediately. Maybe their cart will expire. Maybe they won’t be able to use discounts. Maybe you’re running low on stock. Tapiture uses the fear of items selling out as a means of getting customers to complete their purchases. When it comes to creating a sense of urgency, scarcity is a powerful tactic. It makes the customer feel like they’re going to miss out on something if they don’t act immediately. 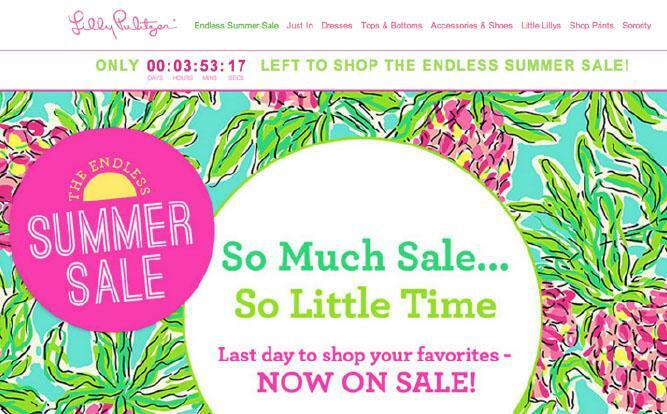 This email from Lilly Pulitzer, while not specifically an abandoned cart email, shows how scarcity can be used to drive purchases. The ticking timer at the top is a visual reminder that the customer needs to take action immediately. The point of the second email is to create a strong sense of urgency within the customer. They need to feel that if they don’t complete their purchase, they will miss out on a great opportunity. The third and final email is the incentive email. In essence, you offer the customer some sort of incentive, like a discount, to complete their purchase. Granted, you have to be careful how often you use this, because you don’t want customers to start expecting incentives every time they leave something in the shopping cart. 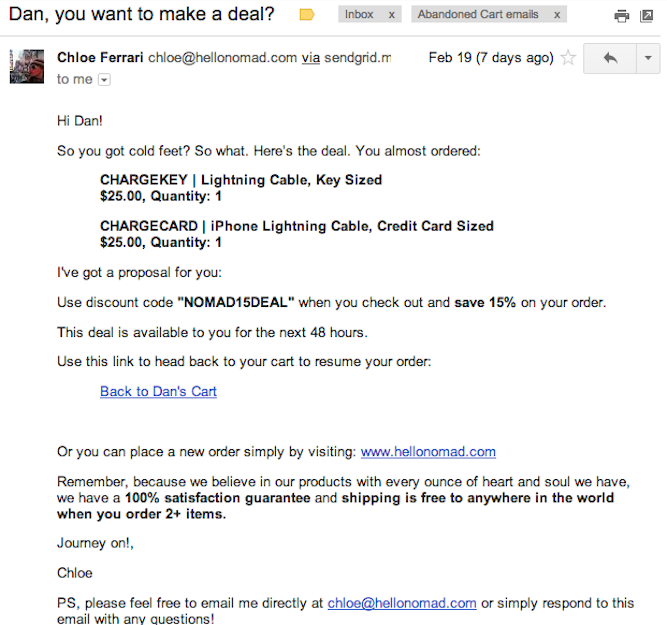 However, using this email with your most loyal shoppers can be a good way of getting them to complete their purchases. Ultimately, you have to decide whether sending an incentive email works for your business. It can be an effective way to recover abandoned carts, but it also involves making less profit on a sale. These emails are only going to be effective if you have the proper knowledge about your customers. An individual might not respond to an incentive if they found a much lower priced product on Amazon. In order to win back your customers, you need to know where and why they abandoned their carts. How can you determine this? By diving into your eCommerce analytics. On the flip side, once you know why a customer abandoned their cart, you have a really high chance (60%+) of getting them to complete their purchase via email. Don’t let money walk out your door. Dig into your analytics and create follow up emails for your various abandoned cart scenarios. This post was written by Skubana. Skubana is an all in one solution that unifies operations for online merchants after the checkout. Skubana automates everything from order management, order fulfillment, inventory management and purchase order management.